College & Cupcakes | My life as an extroverted, fun-loving, and baking-obsessed college student. 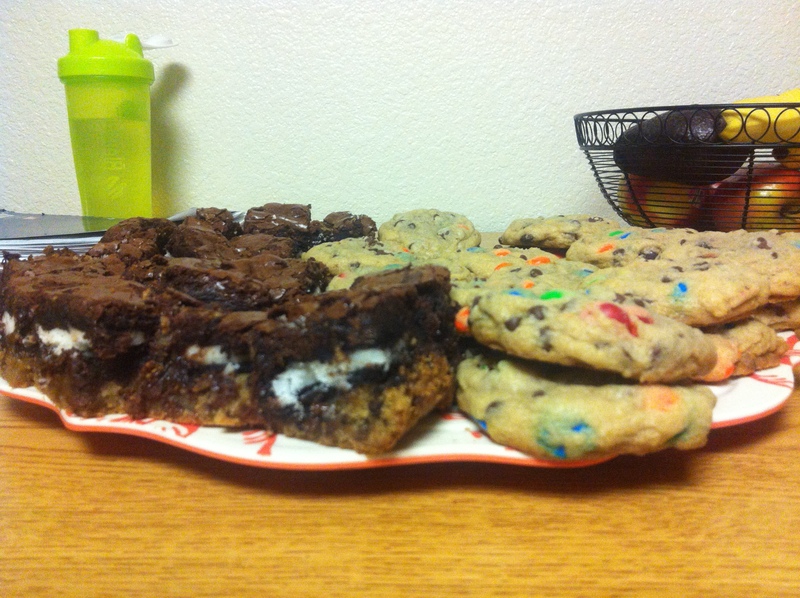 My life as an extroverted, fun-loving, and baking-obsessed college student. A little bit about me, Michaela. I really, really like coming up with cookies that are unexpected. It’s fun to see the reaction you get from someone when you tell them there are potato chips or a whole Oreo in a cookie. Yesterday, I broke out another novel creation: Joey’s. A friend’s love for chocolate covered raisins inspired me to put a twist on the traditional oatmeal raisin cookies…since when something is covered in chocolate, it’s better! This past quarter, I have had the wonderful opportunity to get involved with YoungLife Capernaum. I’ve fallen in love with the ministry, the leaders, and all of the new friends I’ve made. It’s one of the most joyful and loving and humbling experiences I have had in my nineteen years of life. I cannot wait to continue to grow, meet more amazing people, and take any opportunity I can through this phenomenal organization. I brought snack for club this past week…and definitely caused a sugar rush. The reception of my baked goods was overwhelmingly positive and served as a reminder for why I love to bake so much: its a gift of love! There was an abundance of love, smiles, and sugar in addition to the heavy plate of cookies I had. “Slutty Brownies” and M&M cookies were a huge hit with this group. To make the brownies, all you have to do is press cookie dough down in a greased pan, add a layer of Oreos (I used Mega Stuf, and yes, that is a real thing), then pour on some brownie batter. Bake at 350 for 30-40 minutes, let them cool completely, and then cut them out and try not to drool. They’re rich and delicious and you should prepare yourself for all of the mind-blown people you’ll offer them to. For the M&M cookies, I made up a batch of Junk in the Trunk cookie dough and used semi-sweet and mini chocolate chips and M&M’s as my “junk.” You could call me a chocoholic. But you could also bake these and be the one to blame for an epic sugar rush. Your choice! So, a lot of people are gluten free now-a-days. It’s a sad life, because I love my carbs. But I don’t want my flourless friends to get left out of the baking I do so often! The solution? I’ve been tampering with gluten free baking. It’s a lot easier, and much more interesting, than I anticipated. I have gotten a lot of great recipes from Baby Cakes NYC— it’s a darling little cookbook with easy to follow recipes! But these brownies of which I speak are kind of a cop out. In a way. If you consider Trader Joe’s to be the easy way out. In addition to the pre-made mix, I added in lots of chocolate chips and a hefty swirl of natural peanut butter. And you know what? If I didn’t know these were gluten free, I wouldn’t think there was anything fishy going on! It’s been great sharing some wheat-free love with people who don’t often come across a good baked treat. I’ve been doing the whole “get busy living, or get busy dying” thing with the pseudo-bucket lists I have going…and it’s hard to keep up with! A few weeks ago, I finally got to cross something off of 214 in 2014: #116, Go to the Redwoods. After an arduous, windy drive down Highway 17, a large hill with narrow road and tons of cyclists, and actually locating the park entrance, Maddie and I made it to Henry Cowell. And it was spectacular. 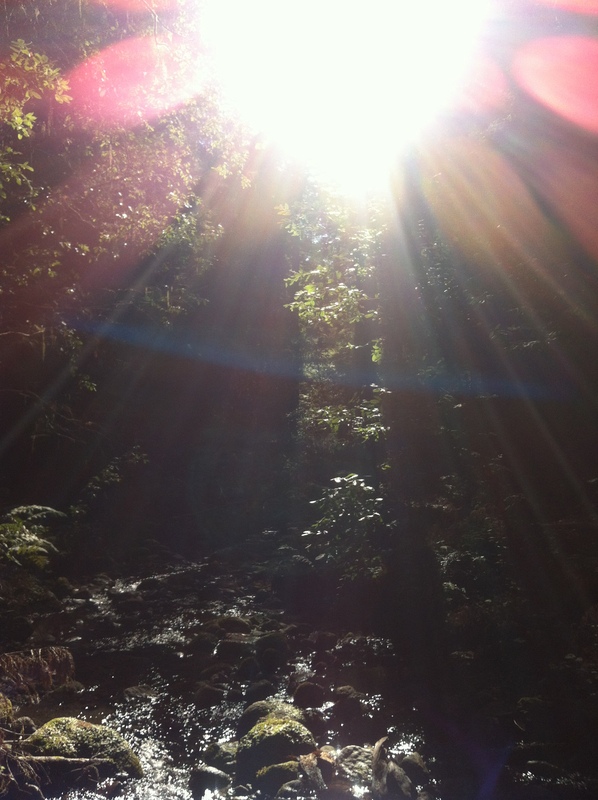 It was a leisurely hike, the sun was playing peek-a-boo above the trees, and there were lime quarries to explore. The view from every direction was breathtaking; the trees of every height were towering. At points I wanted nothing more than a personal hammock, a good book, and all the time in the world. To finish everything off, we had Whole Foods sammiches in the truck bed (since an adventure would not be complete without food). We’ll have to make our way back for more crisp air, tree trunk “bridges,” and exploring. Remember these? They’re chocolate chip cookies with an oreo inside of them…so, magic, essentially. I decided to take this a step further an incorporate another magical ingredient: peanut butter. In the Parent Trap, the twins bond over the delicious, unconventional combination of oreo cookies dipped in peanut butter. If you haven’t tried it, you’ve got to. Before baking/assembling these marvelous, caloric cookies, I pipped peanut butter onto the non-cream side of an oreo, put the two sides back together, and popped them into the freezer until they were set. It’s an extra step that is so, so worth it. It never gets easier, does it? 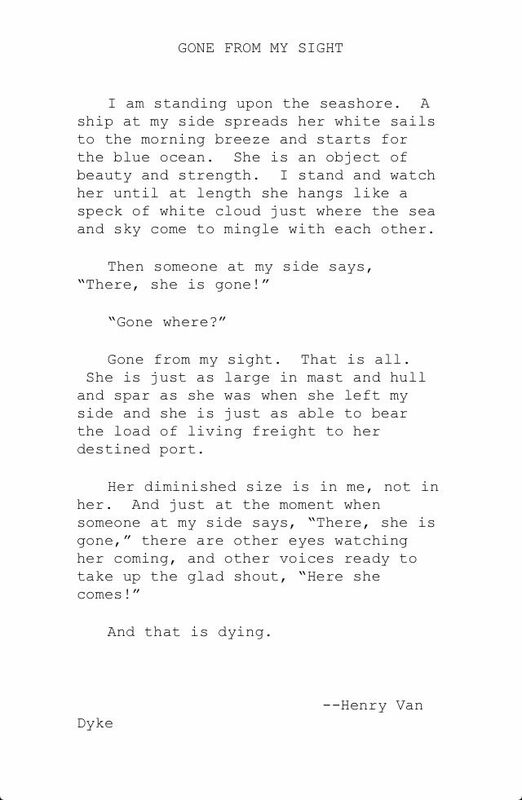 I have learned over the past year and a half or so that death is almost as imminent as it is inevitable, as confusing as it is heartbreaking, and as beautiful as it is tragic. My Nana Mela’s death has demonstrated all of this to me and more. True friendship has the ability to defy age, and this can be proven by the fact that, at our respective ages of 19 and 93, my Nana and I were the best of gal pals. We watched Lifetime movies together, ate plenty of Ben and Jerry’s ice cream, and honestly talked about life and love. Her presence in my life was constant and invincible: she lived right down the street, we had dinner with her often, I spent countless late nights with her. It was like she was never going anywhere– she’d always be in her big, comfy chair. Even when sickness tried to take her, she came right back to us like a boomerang. She was a pistol, one of the sharpest pencils in the drawer, and as witty as could be. And, from playing cards and bunco to her never-ending phone calls, she had a better social life than I did. She was loved so dearly by friends and family, and I know we all will miss her and cherish our memories with her. I have come to truly believe that there is as much purpose in our deaths as there is in our lives. We constantly strive to find our purpose in this world and give it meaning, but I think we forget about the power and impact of our death. In her death, my Nana has left us with a beautiful example of gratitude and happiness, lessons in compassion and love, and an appreciation for humor and “rocka roa” (rocky road candy, from See’s, of course). Not only has she taught and shown us this much, but she has also blessed us with memories and stories that we will have forever. They say that grandmothers are like cupcakes with extra frosting, and that could not be more true of Nana, especially with the sweet tooth she had. When I first read this last Sunday, my first thoughts went straight to all of those “other voices” waiting at the opposite dock for Nana’s ship to come in. Her husband, sister, parents– all of these people who she missed and longed to be with again. It brings me so much peace, even though letting her sail away is heartbreaking, knowing that she is with these people again and has found a new home in the Kingdom of Heaven. Nana, I hope you’ve got all the other angels in stitches over your hilarious stories and witty remarks. I hope there’s a chair as comfy as the one in your living room for you to watch your shows in, next to Nano. I hope that you’re having a wonderful, long-anticipated reunion party with everyone who went before you. We will miss you terribly, but we will also continue to love you tremendously. Thank you for everything, I love you!